Audio Analogue Enigma review | What Hi-Fi? 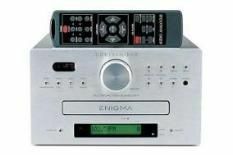 Enigma is an apt name for one of the most infuriating pieces of hi-fi we've ever tested. This Audio Analogue system's control system takes an age to process almost any command. Not only that, but the front fascia buttons are poorly positioned and labelled, making it all too easy to turn off the Enigma when all you're trying to do is open the rather clunky CD drawer. If you do accidentally turn off the unit, it takes forever to start up again, because the valve (yes, really – you can see it through the fascia window) takes an age to warm up. If that wasn't enough, the display is too small to read from any significant distance, and the remote handset looks more suited to a £30 supermarket DVD player. If so much is wrong with this system, why does it get still five stars? The answer is simple: it sounds fabulous. Better than its main rival, the multiple Award-winning Arcam Solo? Yes, clearly. The Enigma resolves more detail than just about any price rival, and presents it in a more coherent manner. Play Prince's Best of… set and this little unit will pound out the beats like they're going out of fashion. Its timing is as crisp as a fresh packet of Walkers, and it'll track fast-moving rhythms with an immensely satisfying enthusiasm. Switch genres, to something like Ennio Morricone's The Good, the Bad and the Ugly, and the Audio Analogue responds with a large, expansive soundstage and strong dynamics and drive. Radio is FM and MW only, and decent as these are – fairly low noise and good insight with both bands – the DAB option is missed. So there you go: despite its price advantage over its Arcam Solo rival, Audio Analogue's Enigma is just too frustrating to better it. We sincerely hope there's a Mk2 soon: it wouldn't take much to make this an absolutely stonking system.